Lately. I have been craving egg salad and after discovering this new “Primal Kitchen” mayo I thought, hmmmm why not? 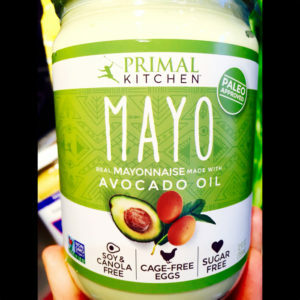 Normally I stay away from mayo, but the Primal Kitchen mayo has wonderful ingredients, made with avocado oil and no sugar!! This recipe is based on two hard boiled eggs and serves two people. Start by cooking the eggs. Once the water comes to a boil, let the eggs boil for 12 minutes. Remove from water and let cool. Make sure they are cool to room temp or cool from the fridge and then peeled. Give them a good chop. 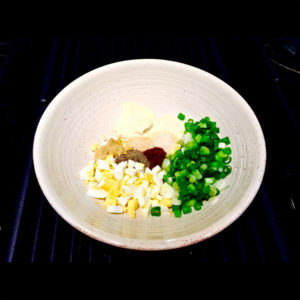 Toss the chopped eggs into a bowl along with the Primal Kitchen mayonnaise, onion powder, garlic powder, black pepper, paprika, dijon mustard and scallions. 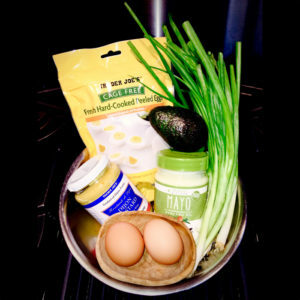 Mix all of the ingredients together and your egg salad is ready to eat. 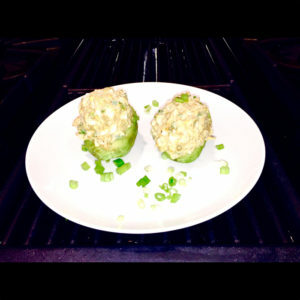 I enjoy eating this egg salad stuffed into an avocado topped off with a few more scallions, but you can also use it in a sandwich as most do! Yum. Delicious, healthy, and easy. Confession: there never seems to be enough time in a day so sometimes I cheat by buying a bag of 1/2 dozen free range hard boiled peeled eggs from Trader Joe’s. I was pleasantly surprised by the quality of the eggs. It makes it easier to stay on the healthy track with the pre-cooked & peeled eggs.